On my to-do list for quite some time has been tracking down the various locations in the registry that malware and attackers use to remain persistent on a system. Typically, one of my initial examination steps when confronted with malware is to review the various auto-run locations. The way I approached this step works but it isn’t as efficient as I want it to be. I do most of my registry analysis with RegRipper and it even extracts numerous auto-run locations. However, when I’m looking at persistence mechanisms I go with the Microsoft Autoruns utility since it is the best tool out there for extracting auto-runs from a system. This is where the inefficiently comes into play. I’m using two tools to extract registry auto-run locations. With the Autoruns utility, I’m forced to do additional work since it only works against mounted drives (or images). What I want is to solely use RegRipper to perform this task since it can extract this information in seconds. To do so, I had to track down the various persistence mechanisms to see what, if anything had to be added to RegRipper. This post shows what and how I went about this. To track down the registry persistence mechanisms I first needed an authoritative resource on the various locations. The Autoruns utility is the best tool for reviewing auto-runs locations since it is constantly updated. The locations checked by the tool would be one of the most authoritative resources on the subject. I reached out to the Win4n6 group to see if anyone knew of a site that outlines the different places the tool checks. Both Troy Larson and Adam said the tool itself can be used to determine this. I picked my platform – Windows 7 64-bit – to get the best coverage of artifacts and followed their guidance. I ran Autoruns (v11.4) against my system. After it completed I selected Options from the menu then Filter Options on the drop down. 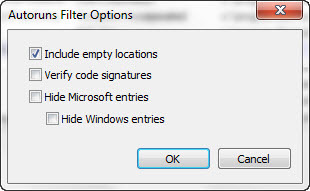 In the Autoruns Filter Options window: checked the box next to Include empty locations and deselected Hide Windows entries followed by clicking OK. 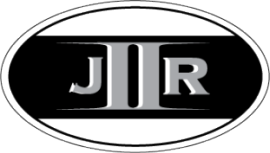 The end result is the most comprehensive listing of auto-start locations. More extensive then I have ever seen in books, presentations, trainings, and other tools. You may have read Harlan’s post Wow6432Node: Registry Redirection or my post Houston We’ve Had a Problem – Wow64 about the impact Wow64 has on where to look for persistence mechanisms. Well, there are numerous auto-run locations redirected due to Wow64 and this is a topic that is discussed very little in Digital Forensics and Incident Response. To see what I mean run Autoruns against a 64-bit system and you will see all the different Wow64 entries that are being missed by our processes, tools, and literature. Obtaining a comprehensive list of the various persistence mechanisms was only the first step. My idea wasn’t to see every auto-run location added to RegRipper. This would require a lot of work; work done by myself or someone else volunteering their time. The more effective approach is to determine which persistence mechanisms are actually being used by malware. This is what Elizabeth Schweinsberg did when she scraped an antivirus website to determine the most common persistence mechanisms. Similar concept but different approach. I started with the most comprehensive listing of auto-run locations (Autoruns output from my 64-bit system). Then I researched every registry key and values to determine which ones were actually used by malware. I leveraged the Malware Analysis Search since it indexes numerous sites related to malware such as antivirus sites and online sandboxes. Basically, I went through hundreds of auto-start locations and selected the locations based on how many hits I got. Only a few hits wasn’t worth the effort to create test data and write a RegRipper plug-in. It took numerous hits (at least two pages worth) to make it worth the while; for it to be considered as Harlan says low hanging fruit. Side note: I didn’t apply the search hit count to the Wow64 folder redirection locations. I barely got any hits for these locations. This shows how antivirus sites and online sandboxes are not accounting for all the artifacts created by malware. For the past few months I have been focused on RegRipper; specifically on the plug-ins. As a result, I know fairly well what every plug-in in the RegRipper archive does, what it checks, and which ones fall into the auto-runs category. I proceeded to review every RegRipper auto-run plug-in against my list of persistence mechanisms. What I found out was pretty cool? Excluding the Wow64 folder redirection keys/values, RegRipper already accounted for the majority of the persistence mechanisms I noted. However, I did identify what new plug-ins was needed and which ones needed to be updated. My last step in journey to track down persistence mechanisms was to reach out to Harlan for a few reasons. First if I have any questions about Windows forensics especially with the registry then he is at the top of my list. The other reason is because he is the author of RegRipper and I felt letting him know what I was trying to do was the right thing to do. His reaction caught me by surprise after I sent him all my documentation and notes. He was willing to start writing the new plug-ins and updating the existing ones. Really cool and to me this showed his passion for our field. His willingness to help me out with about 20 different plug-ins. As he mentioned, RegRipper is being updated. Actually, he is doing all the updating and I’m just trying to give him any support I can. The locations identified in this post has been documented on the ASEPs RegRipper Wiki page. The page outlines all the auto-run plug-ins and the locations they check. This is a piggyback post to an issue Harlan has been raising about the Wow64 issue. His most recent post on the subject Wow64Node: Registry Redirection goes into detail about what Wow64 is, it’s impact on registry analysis, and contains links to great resources. After giving some thought to this issue I’m in full agreement with Harlan when he said “this is huge”. Computing is moving on from 32-bit to 64-bit platforms. I am already witnessing the transition since the majority of the systems I see running Windows 7 are 64-bit. We are entering a 64-bit world and as this transition occurs systems will run both 64-bit and 32-bit applications. This is where Wow64 comes into play and I wanted to follow up Harlan’s post with a few more examples about why we should be aware about this issue. I’m not only expanding on what Wow64 is but I’m highlighting issues with our processes and tools to demonstrate why this is an important issue. In addition to the links provided by Harlan, the Windows Internals book contains information about Wow64. It states “Wow64 (Win32 emulation on 64-bit Windows) refers to the software that permits the execution of 32-bit x86 applications on 64-bit Windows”. Part of the emulation involves redirecting a 32-bit application in both the file system and registry. “To maintain application compatibility and to reduce the effort of porting applications from Win32 to 64-bit Windows, system directory were kept the same. Therefore, the \Windows\System32 folder contains native 64-bit images. Wow64, as it hooks all the system calls, translates all the path-related APIs and replaces the path name of the \Windows\System32 folder with \Windows\Syswow64. Wow64 also redirects \Windows\LastGood to \Windows\LastGood\syswow64 and \Windows\Regedit.exe to \Windows\syswow64\Regedit.exe. Through the use of system environment variables, the %PROGRAMFILES% variable is also set to \Program Files (x86) for 32-bit applications, while it is set to \Program Files folder for 64-bit applications." “the registry is split into two portions: Native and Wow64. By default, 32-bit components access the 32-bit view and 64-bit components access the 64-bit view”. “To implement this, Wow64 intercepts all the system calls that open registry keys and retranslates the key path to point it to the Wow64 view of the registry. Wow64 splits the registry at these points: HKLM\Software and HKEY_CLASSES_ROOT”. “Under each of these keys, Wow64 creates a key called Wow6432Node. Under this key is stored 32-bit configuration information. All other portions of the registry are shared between 32-bit and 64-bit applications (for example, HKLM\SYSTEM)." Wow64 is one of the topics that have not been discussed extensively within our community. Harlan has been on his soapbox trying to raise awareness about its impact on our work and he provided examples how it affects registry analysis. Both Christian Wojner in his paper The “Wow-Effect” and Lenny Zelster in his post Incident Response on 64-Bit Windows Using 32-Bit Tools highlighted the impacts of file system redirection. Basically, the authors were demonstrating that an analyst may not be getting the whole picture when running 32-bit applications on a 64-bit system. The 32-bit applications were redirected to the \Windows\Syswow64 folder and were incapable of seeing the files located in the Windows\System32 folder. The “Wow-Effect” paper mentioned there are more situations and scenarios where the “Wow-Effect” can impact DFIR. He even suggested the reader could instantly come up with a lot more scenarios. I came up with a few and they impact: live, malware, and post-mortem analysis. Both of Christian and Lenny's articles illustrated the Wow64 issue when performing live analysis. Wow64 introduces another wrinkle when performing live analysis besides running 32-bit executables on a 64-bit system. Indicators of Compromise (IOCs) are becoming more mainstream within enterprise environments. It appears more and more people are trying to leverage IOCs to determine if their organization is compromised. The wrinkle Wow64 throws into the process is on the way people use IOCs. IOCs are written by an author based on their systems and their environment. If a user downloads an IOC and runs it in their environment without knowing about the author's environment then the user may reach a false conclusion if the IOC performs a file and registry check. If a user were to download this IOC and run checks against a 64-bit system they may encounter an issue and not even know about it. The Run key in the IOC is either for a 32-bit Skyipot/Wyksol Trojan on a 32-bit system or a 64-bit Skyipot/Wyksol Trojan on a 64-buit system. If a 64-bit system was infected with a 32-bit Skyipot/Wyksol Trojan then the Run key of interest will be located underneath the HKLM\ SOFTWARE\Wow6432Node. The current registry check in the Skyipot/Wyksol IOC will miss it. As more and more organizations start to use IOCs it will be critical for them to make sure they are using IOCs that are compatible with their 64-bit/32-bit environments. Otherwise the IOCs won't be as effective as they should be. Practical Malware Analysis defines malware analysis as "the art of dissecting malware to understand how it works, how to identify it, and how to defeat or eliminate it". At times when reversing malware dynamic analysis is performed to see how the malware behaves as it executes. This is an excellent technique to identify what changes are made to the system such as file creation or registry modification. The intelligence gained by identifying these changes can be used to write IOCs, provide others will indicators to look for, or to perform checks on other systems to determine if they are infected. The Wow64 issue comes into play when doing malware analysis; both if it is done using an online service or your own platform. Online malware analysis services provide an easy method for people to perform dynamic analysis on a piece of malware. There are numerous free online services to choose from and I randomly selected ThreatExpert. Unfortunately, a good number of these services don’t provide detailed information about the systems the malware executes on so the information they provide may not be complete. To illustrate let’s use the Wow64 issue to see what we can find out about the systems on ThreatExpert. The Run key I mentioned before (it’s also the same one Harlan mentioned) is a popular location for malware to maintain persistence on a system. Searching the ThreatExpert site shows numerous malware reports with this registry key (Google search had 10,400 results). Now let’s search for the same key but taking Wow64 into account by searching for this key. The Google search resulted in two hits; seriously only two hits. This demonstrates the majority of the ThreatExpert analysis is not running 32-bit malware on a 64-bit system to reveal all artifacts. ThreatExpert is not the only service where this occurs; happens at Anubis (419 Google Results vs. Zero Google Results) and antivirus sites such Symantec (8,800 Google Results vs. Zero Google Results). Side note: to perform the Google search use the site: operator to point it at the website. My attempts to included the links to the search results didn't work. Wow64 has the same impact on those who perform malware analysis themselves as opposed to online services. Are 32-bit malware being executed on 64-bit systems? If not, then the end result will be similar to the antivirus and automated analysis sites. Harlan did an outstanding job highlighting the impact Wow64 has on registry analysis. There are a lot more autostart locations beneath the Wow6432Node then just the Run key. These locations are not getting parsed by numerous registry analysis tools. From open source tools to really expensive software such as the one that starts “En” and ends in “Case” (I’m running v6.X). Side note: as Harlan mentioned RegRipper is getting updated to account for Wow64. There are other important registry keys that have a 32-bit equivalent beneath Wow6432Node that has nothing to do with malware or autostart locations. One of my initial steps in any case is to profile the system to get a better understanding about what I’m facing. One of the areas I consider when profiling is the installed software on a system. It tells me a lot about what type of data and artifacts I should expect. Harlan mentioned in a previous post how the Uninstall key beneath the Wow6432Node contained references to software not listed in the 64-bit Uninstall registry key. Well, I just looked at my system and I’m seeing the same thing. If I don’t take into account the Wow64 issue when profiling a system then I won’t see the complete picture. In closing, I wanted to say thank you to Harlan. Thanks for being consistent with trying to bring this issue to the forefront and making the community more aware about its significance. This is a pretty significant feature as it relates to malware. Over the years people have grown accustomed to using user accounts with local administrator privileges on their Windows systems. It even reached a point to where certain applications don’t function properly without these elevated rights. The issue with doing everyday tasks with administrative privileges is that any application executed by the user also runs with elevated privileges. If malware executed on a system with elevated privileges then it could make changes system wide. What UAC does is to restrict the elevated privileges from applying to every application launched by the user. The impact on malware is pretty significant; it is restricted to the locations on the system where the user account has permissions. In most cases, these areas are the user’s profile and any mapped drives. The malware will no longer have the ability to make system wide changes unless it can elevate its privileges. “ZeroAccess must elevate its privileges to install successfully, but in order to do this from a non-administrator account on UAC enabled versions of Windows, a UAC popup will appear. End users are more likely to be suspicious of a file they have just downloaded from the internet that they thought was an illegal keygen, crack or hacked version of a game; they may also be suspicious if an unknown exe file causes a UAC popup while the user is browsing the web (exploit pack infection vector). As a result the user may choose not to allow the program to proceed, thus ZeroAccess installation may fail. To bypass this possible problem, ZeroAccess disguises itself by forcing the UAC popup to appear to come from a different, benign-seeming program. A clean copy of the Adobe Flash Installer (InstallFlashPlayer.exe) is dropped to a temporary directory and the DLL load order of Windows is abused to ensure that ZeroAccess is loaded into the clean file’s process address space when it is executed. As can be seen the folder where the application loaded from (Temp) was checked before the C:\Windows\system32 directory where the msimg32.dll is actually located. The ZeroAccess Rootkit uses a mixture of social engineering and the DLL search order vulnerability to bypass the UAC feature. Metasploit was my go to tool to demonstrate UAC’s impact on malware and to verify how effective the DLL search order exploit is for bypassing the feature. For those solely interested in the testing skip ahead to Restrictions Enforced by UAC section. For completeness and those who want to replicate my testing I’m providing the information about my Metasploit setup. My setup involved: create a custom executable to UAC’s restrictions on privileges, create custom DLL to bypass UAC with, and set up Metasploit listener for the reverse connections. My network configuration was Windows 7 and BackTrack virtual machines both connected to a virtual network. After I created the custom reverse shells I manually copied them over to the Windows 7 virtual machine for execution. I built the custom executable with msfpayload and used the following command. I built the custom DLL with pretty much the same command but I replaced the X with a D as shown below. It’s always helpful to first see things as they should be. The first test was to examine the privileges restrictions imposed by UAC to see firsthand its impact on malware from the attackers’ perspective. I manually copied the msimg32.exe to the C:\Users\lab\AppData\Local\Temp directory on the Windows 7 VM and then executed it. I dropped into the shell and executed the whoami command to see what privileges I had. The restricted privileges imposed by UAC was expected and matched my previous testing. I restored the Windows 7 VM to a snapshot in a clean state and copied the msimg32.dll and a Flash Installer file to the C:\Users\lab\AppData\Local\Temp directory. 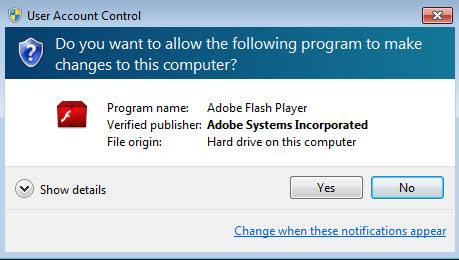 I executed the Flash installer file (InstallFlashPlayer.exe) by double clicking it and was greeted with the UAC popup. Notice how the verified publisher shows Adobe Systems Incorporated. After I clicked Yes to allow the program to make changes to the system on the BackTrack VM I got a successful shell as shown below. This means the msimg32.dll in the Temp directly was loaded before the legitimate DLL in the System32 directory. The output showed the shell was running under administrator mode confirming UAC was successfully bypassed. Again, I took the testing one step forward by successfully creating a file in the System32 directory (notice the access denied message didn’t appear).